Do I Need Active or Passive Humbuckers? While metal is a broad term covering so many individual styles, the genre is defined by one thing – energetic, aggressive, and colossal guitar sounds. It doesn’t matter whether it’s nu metal or Djent, retro or modern, Slipknot or Metallica, all metal bands share an immense guitar tone you can’t help but thrash along to. Another thing they all tend to have in common (aside from the talent to create and play such epic music) is a good guitar pickup. You can forget single-coil pickups – even though some artists have made good use of single-coils in metal, this genre is best known for its heavy use of robust humbuckers to produce the powerful sound required. So, to help metal players make an informed decision, we’ve selected six of the best pickups for metal, representing some of the most popular choices among guitarists in this genre. Some are active, some are passive, some are modern classics, some are newer signature models, but all will deliver an awesome metal tone. Then stick around for our short guide on what makes a good metal pickup! A seriously tight, edgy and aggressive active signature set. Massive metal output from this active neck humbucker. A humbucker that captures the essence of Dimebag. A thick helping of metal distortion! The Invader’s popularity speaks for itself. This epic humbucker set is the result of a conversation between EMG and Metallica legend James Hetfield, who asked the brand to create a signature set of pickups that combined the warmth and clarity of a passive humbucker with the punch and output of active electronics. And they delivered! This set receives full marks for style, as the brushed chrome looks awesome. They were designed with stealth in mind, although there is nothing stealthy about the sound – they’re super-hot! Under the cool chrome covers sits individual ceramic pole-pieces and bobbins in the neck humbucker for huge attack, while steel pole-pieces feature in the bridge, offering a cleaner bass sound. Ultimately these pickups really sing – punchy, warm, huge sustain, well-balanced and versatile, with the ability to cut through the densest mixes. You don’t have to be a diehard Slipknot fan to appreciate the crushing tone on offer from this set of active Seymour Duncan humbuckers – it’s insane. Slipknot guitarist Mick Thomson worked with the Californian brand to produce these awesome signature humbuckers that retain the power of the original Blackouts, but with Mick’s unique tone in mind. They feature ceramic magnets and active electronics for huge power and reduced excess noise. This set is awesome for all hard rock and modern heavy metal, although perform better for low tunings – the bridge sounds ominous with heavy palm muting as the low-end is so tight and clean. Meanwhile the treble is bright without being abrasive, so melodic lead and high-paced solos are well catered for. EMG are undoubtedly leaders in the field of active humbuckers, and their EMG 85 is a modern classic – no wonder it’s so popular with metal players. Made with a powerful Alnico V magnet, this pickup offers a huge output that retains a natural tone. Unlike some other active humbuckers, the EMG 85 doesn’t suffer from any sterility, instead offering quite a warm tone, with hefty low-end, articulate mid-range, and a rounded treble. It keeps clear and focused as the volume increases, while it’s incredibly well-behaved when it comes to excess noise. The EMG 85 is excellent for both the bridge and the neck, although is truly at home in the neck while its brother – the EMG 81 – sits in the bridge. There’s no way we could produce a chart of the best metal pickups without including the signature humbuckers of the late Dimebag Darrell – one of the greatest metal guitarists of all time. The Seymour Duncan SH-13 Dimebucker naturally proves popular with rock and metal players, as well as any guitarist after a searing-hot tone. Handmade in California, the humbucker features a powerful ceramic bar magnet with two stainless-steel blades, covered with black vinyl that features Dimebag’s signature. The meaty low-end is perfect for chugging metal rhythm, although it’s inherently bright and cuts through any mix – perfect for energetic shredding. The harmonics you can achieve are awesome too (think of Cemetery Gates and you won’t be too surprised!). An essential purchase for Dimebag fans. On the face of it, the DP100 Super Distortion looks like a regular humbucker, but it performs like anything but. In fact, as DiMarzio rightly claim, this pickup started ‘a sound revolution’, with its ability to send a tube amp into complete overdrive. Available in a wide range of cool colors (including black, white, purple, blue, cream, and camouflage), the Super Distortion features a powerful ceramic magnet to deliver a very high output with great balance and good warmth. There’s a thick bass sound, boosted mids and bright trebles, which make it excellent in the bridge for metal lead playing – just ask Paul Gilbert who used these humbuckers during his Racer X years. Overall, an awesome pickup from DiMarzio. When you hear the sheer metal power on offer from this modern humbucker you can tell why it’s so popular. Handmade in California, this unique humbucker features three large ceramic magnets with overwound coils, while twelve oversized metal oxide pole pieces are used to give the pickup its distinctive chunky look. It has a huge output and excels at volume, with zero hum or feedback experienced, while both notes and chords retained their clarity. The SH-8’s clean tones aren’t bad, although can come across as a little shrill. Still, it more than makes up for it when distorted. It offers a thick, fat sound with big low-end and bright treble – perfect for the heaviest metal rhythm and lead. As we mentioned earlier, 99 percent of artists in modern metal use humbuckers – which is why our chart above represents only humbuckers. The power on offer from humbuckers is what metal guitarists crave, while their noise-cancelling abilities are perfect for when the volume and gain increase. For gigging metal guitarists, humbuckers are pretty much essential. It’s also vital that the sound doesn’t get too muddy, especially when tunings get low and distortion is piled on. It’s easy for deep metal rhythm playing to become lost in a sea of noise, so a pickup that ensures a defined low-end is another must-have in this genre. It’s worth remembering that metal can be very melodic, so raw power must also make some room for tonal quality and warmth, with a mix-cutting treble sound that’s not too shrill. We’re not asking for too much, are we? It’s a question that’s very relevant in metal, although which style you go for will depend on what you want from your pickup. Let’s have a quick look at the pros and cons of both active and passive electronics to help make your decision easier. Starting with the advantages, active pickups – before the preamp is engaged – have a lower natural output, so they are less prone to hum and background noise. When the pre-amp is on, active pickups have an unrivalled output – they can be unbelievably hot, while remaining very clear and detailed. This is one reason why metal players favor active electronics. Passive pickups, on the other hand, may have slightly lower output (although don’t be fooled – some can be hotter than you’d ever need), but they have a bigger dynamic range, suiting creative lead players. 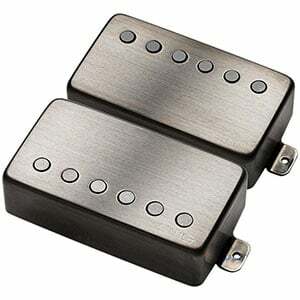 Passive pickups also tend to have a slightly warmer and more natural tone when compared to their active counterparts. The disadvantages of the two should now be pretty obvious. Active pickups tend to have a lower dynamic range, and have a slightly colder tone. Passive pickups, meanwhile, are more affected by background noise, and can be more prone to feedback when the volume really increases. However, we’re being pretty general in our descriptions because ultimately there are so many models in so many price ranges, all of which have their own tonal qualities. The best way to truly understand the difference is to play around with both styles or, at the very least, listen to others play them. After reading our chart and guide, you should have a better idea of what makes a good pickup for metal and which brands deliver the best models. If you are planning to replace your pickups – whether upgrading from stock humbuckers or just fancy a change – make sure you read reviews and watch videos of the models you’re interested in, to get a real feel for how they sound, and whether they’re suitable for the style of metal you play. Good luck with your hunt! Pleeease! How close minded isn’t this list? “Best metal pickups”, and all you can come up with is brands like EMG, Seymour Duncan, DiMarzio? The list should be called “Most known pickups”. How about nice hand wound pickups? Crushing tone and dynamics, such as pickups from Bare Knuckle, Oil City, Motor City, JWP, Bulldog, Alchemy, Lundgren? Thank you. Most metal heads know about the more common brands. Those pick-ups are good, but you want to find out other good, less known pickups. Thank you for a good article, nonetheless! As Rob Ericks mentioned above there are many hand winders out there that should be looked at too. I am a small one man (me) custom hand winder in Arma, Kansas known as ODEZZA Handwound Pickups and I build a Humbucker pickup called the JSJ Motherbucker that is a Shredder/Metal machine that I would put up against any of the pickups on your list. But thanks for giving me the opportunity to speak on this subject and know who I am competing with for this honor.